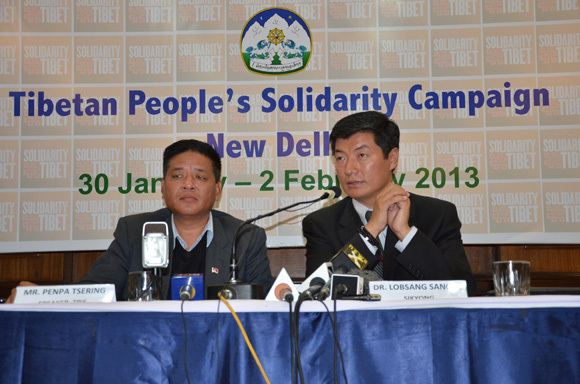 » Briefing on Press Conference for Tibetan People’s Solidarity Campaign. 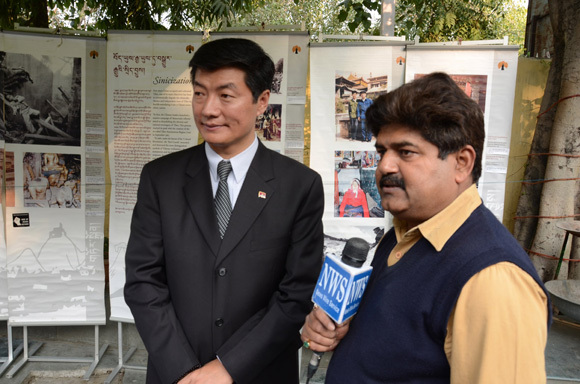 January 29, 2013, Delhi: In the lead up to the Tibetan People’s Solidarity Campaign, the Speaker of the Tibetan Parliament in Exile and Sikyong (political leader of Central Tibetan Administration) addressed a joint press conference at the Press Club of India, New Delhi. Over 100 reporters – print and visual – representing major national and international agencies attended the press conference. The press conference was held in light of the gross human rights violations inside Tibet, wherein the situation inside Tibet is exacerbated by a deepening crackdown on peaceful expressions for freedom by the Tibetan people inside Tibet,thus deepening the anguish Tibetans feel. Therefore, Since 2009, 99 Tibetans, mostly young men and women, have burned themselves calling for ‘freedom for Tibetans’ and the ‘Return of His Holiness the Dalai Lama to Tibet,’ in an unprecedented spate of self-immolation protests by Tibetans inside Tibet. 83 of them have died. More than 5000 Tibetans have converged from India, Nepal and Bhutan and over 1500 Indian supporters are expected to partake in the campaign. In addition to the press conference, a short film by Department of Information and International Relations (DIIR) of CTA titled ‘What’s China doing in Tibet’ was screened. Alongside, a travelling exhibition on Tibetan history and culture entitled ‘Looking Homeward’ and a ten-panel photo exhibition on self-immolation is underway. At today’s conference, the Speaker introduced the 4-day mass campaign (January 30 to February 2) which will be marked by events in Delhi such as mass rallies, prayer meeting, hunger fast, inter-faith meeting, public address by political leaders, lobbying foreign diplomats and Indian policy makers. The highlights include inaugural address by India’s former deputy Prime Minister Shri L.K Advani on January 30 at Talkatora stadium and a prayer meeting on February 1, to be presided by throne holder of the Gelugpa tradition of Tibetan Buddhism and the first of Indian-origin Kyabje Gaden Tri Rinpoche. Sikyong Dr Lobsang Sangay gave a general overview of the situation inside Tibet including the status of the Sino-Tibetan dialogue, the current crisis inside Tibet and the international attention towards Tibet. Sikyong Dr Sangay’s address particularly stressed on the driving force that have compelled nearly 100 Tibetans to set themselves on fire in protest. The press conference lasted for about 90 minutes. The press conference also included a question and answer session during which questions pertaining to India’s Sino-Tibet policy, status of the Sino-Tibet dialogue, India’s bilateral economic ties with China, China’s international standing and international response to self-immolations were raised.